Vividly colored. Relatively inexpensive. Effectively cures nightmares? 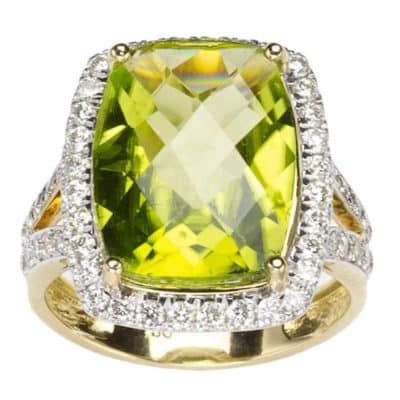 Go green and learn all about peridots, the official August birthstone. Suffering from nightmares? Try placing a peridot next to your pillow. 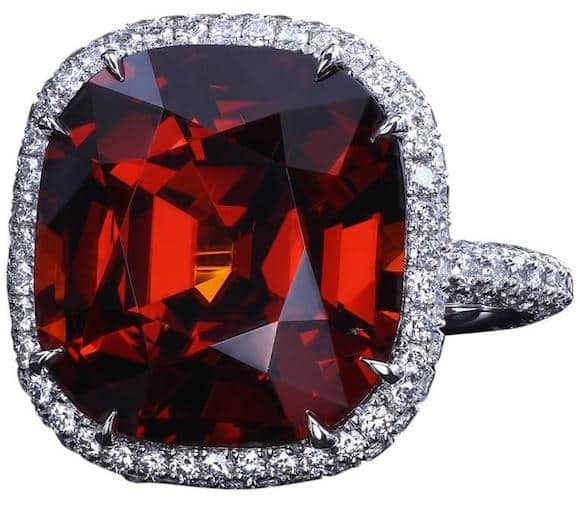 In ancient Egypt, where the semiprecious stone was first discovered (and where it was referred to as the “gem of the sun”), it was believed to have magical powers, including the ability to protect people from evil spirits, including the ones responsible for bad dreams. Luckily for those wanting to test their efficacy against nighttime terrors, peridots are relatively inexpensive. 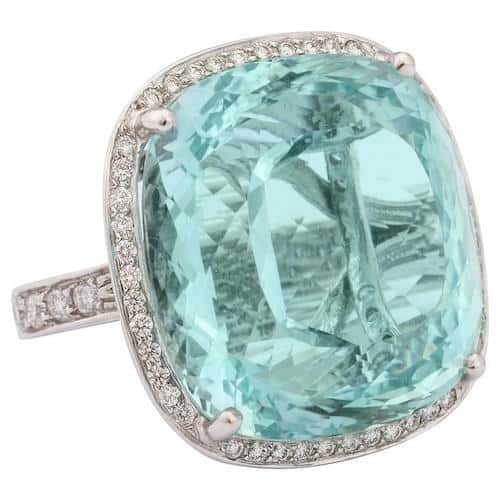 Luckier still for August babies, whose birthstone it is, the vibrant green jewel goes beautifully with a summer wardrobe. Peridot is gem-quality olivine, a silicate mineral whose chemical composition includes magnesium and iron. 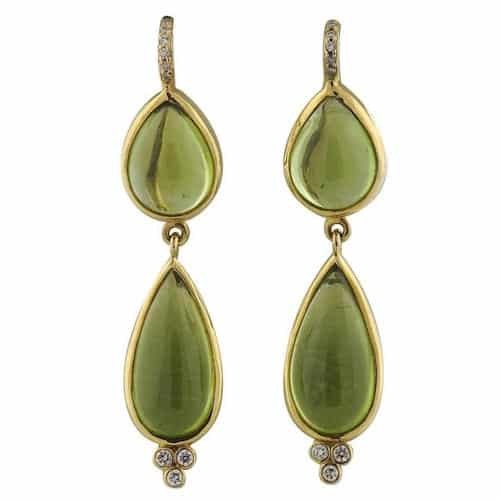 The latter element is responsible for the stone’s vivid yellow-green color, which ancient Greek author Alexander Polyhistor compared to “that of fresh oil.” The more iron in the mineral’s composition, the deeper the green. Although olivine is commonly found in volcanic rock like basalt, gem-quality peridot far less abundant. It occurs most often in the form of irregular nodules — rounded rocks with peridot crystals inside — and, less frequently, in large crystal formations, which makes sizable examples very rare. 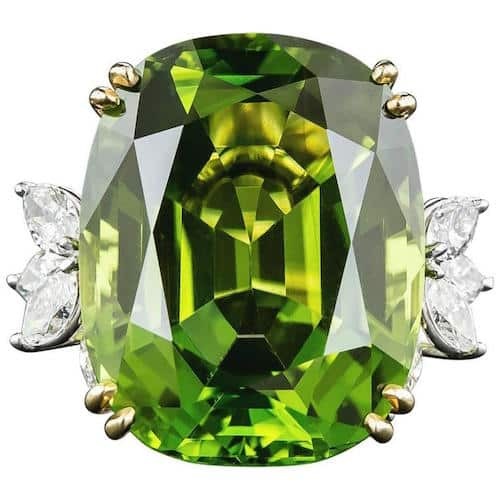 The GIA dubs Peridot an “otherworldly stone” since crystals have also been discovered in meteorites and, in 2005, in the comet dust brought back by the Stardust robotic space probe..
Those ancient deposits have been exhausted. Today the largest and finest peridots come from Pakistan and Myanmar, while the San Carlos Apache Reservation in Arizona is the source of most of the stones used in mass-produced jewelry. Peridots are also found in Vietnam, Tanzania and China. Zabargad is the source of the most famous large peridots, several of which are prized parts of public collections. The Natural History Museum in London owns a 146-carat step-cut stone, but it is the Smithsonian Institution in Washington, DC, that boasts the largest cut peridot, weighing 310 carats. Then there’s the Chicago Field Museum’s pear-shaped Green Goddess, weighing 154-carat and etched with the figure of a woman. 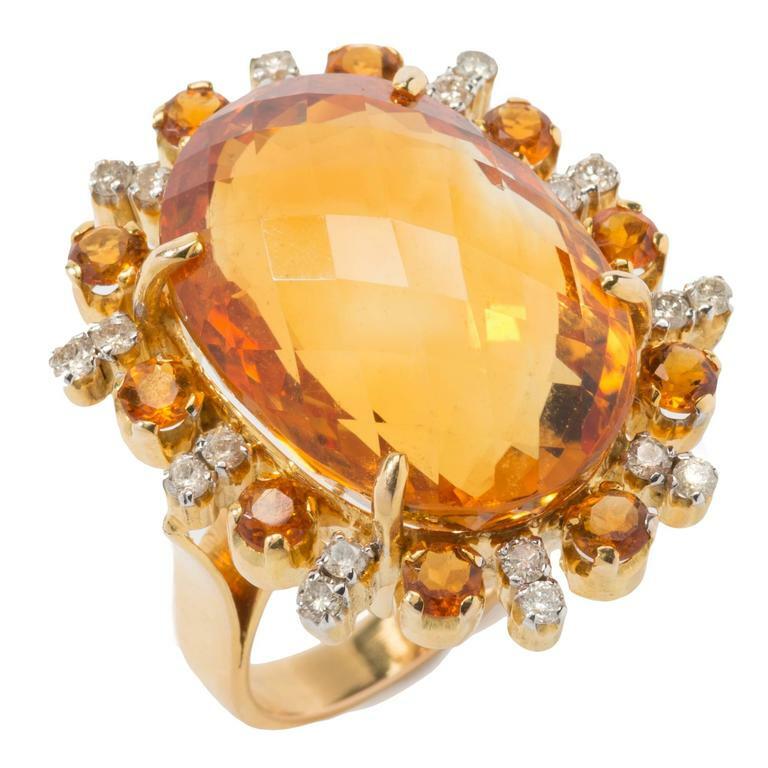 It was acquired at the World’s Columbian Exposition in 1893, and In 2008, the renowned Chicago jeweler Lester Lampert designed an 18-karat yellow-gold setting for the stone, surrounding it with 3.24 carats of yellow diamonds. Peridot has a long and illustrious history. One of the earliest surviving mentions of the gem is in Pliny the Elder’s Natural History, from AD 70. 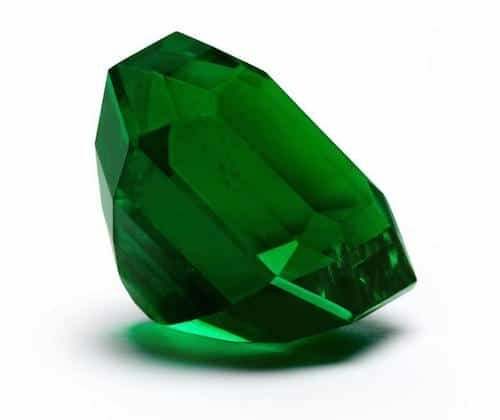 Pliny referred to the green stone as topazos, after the ancient name of island where it was found (at some point, the connection was lost and the word was applied to the entirely different golden mineral we call topaz today). 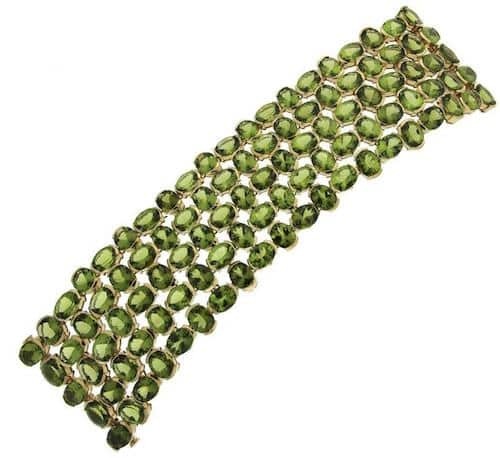 Certain biblical scholars have theorized that it was one of the stones in the breastplate of Aaron, brother of Moses, and some historians believe that Cleopatra’s famous “emeralds” were actually peridots. We know for a fact that the impressive 200-carat jewels decorating the shrine of the Three Holy Kings in Germany’s Cologne Cathedral, thought for centuries to be emeralds, are in reality peridots. The finest peridots are grass green and clear to the eye. They can be cut in many different styles. The best part is that they are very affordable. One caveat, with a score of 6.5- 7 on the MOH hardness scale, peridot is prone to scratches, even fractures. 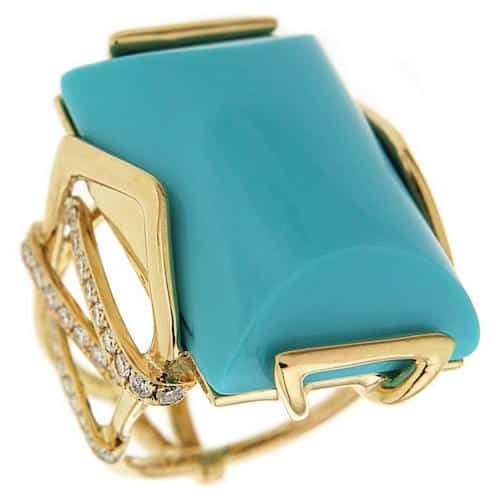 So if you are hard on your jewelry, it may not be for you.